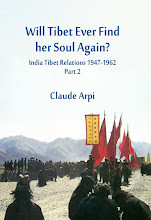 One often-asked question is: why did India not take a stronger stand on the Tibet issue in October/November 1950, when Eastern Tibet was invaded by the Chinese People’s Liberation Army? One of the reasons is the nefarious influence that K.M. Panikkar, the Ambassador in Communist China, played on the Indian Prime Minister and the fact that Nehru chose to follow his advice against those of senior diplomats like G.S. Bajpai or politicians like Sardar Patel of Rajaji. The fact that there was no American and only a couple of British nationals live on the Tibetan plateau, did not bother Panikkar and Nehru. it was China’s earnest desire to settle the problems by negotiations and peace, and that he [Zhou] had instructed the Chinese Ambassador to India to enter into preliminary contacts with the Tibetan Delegation in Delhi and to make arrangements for their journey to Peking. Zhou Enlai said that he greatly appreciated the view taken by India and would do everything possible to come to a peaceful settlement “on the understanding that Tibet was an integral part of China, entitled to local autonomy and to its own institutions”. During this meeting, Panikkar, on his own, promised that India would not move in case Tibet is forcefully liberated. On 26 August 1950, in an aide memoire submitted to the Chinese Government, K.M. Panikkar went a step further, he changed India's policy vis-à-vis Tibet. This would trigger the most dramatic consequences for India. In his note, Panikkar described Tibet’s status as ‘autonomy within framework or Chinese sovereignty’, and not anymore ‘suzerainty’ as it had been done during the previous decades. The two words had a very different legal meaning and Panikkar knew it. During the following months, South Block tried to revert to ‘suzerainty’, but it was too late, the damage was done. Three days after presenting his aide-memoire, Panikkar send a Top Secret cable to Nehru to inform him that he had met the Director of Asian Section of the Chinese Ministry of Foreign Affairs, who had called on him on behalf of Zhou Enlai to discuss India’s (more correctly Panikkar’s) aide-memoire on Tibet. for reaffirmation that India had NO political or territorial ambition in Tibet and stated that it is earnest desire of Chinese Government to settle Sino Tibetan matters amicably and by peaceful means. Six weeks before the invasion, the fate of Tibet was sealed. But Nehru and his Ambassador continued to foolishly think that the future of Tibet would depend on ‘negotiations’ in Delhi or Beijing. It was absolutely wrong. A telegram sent by Mao on August 23, 1950, (2 days after Panikkar had met Zhou) is telling. It is addressed the Southwest Bureau, repeated to the Northwest Bureau in Qinghai Province and entitled, ‘Strive to Occupy Chamdo This Year and Advance to Lhasa Next Year’. The plan to push for occupying Chamdo this year and to leave three thousand men to consolidate Chamdo is good. You can actively make preparations according to this plan, and when it is ascertained by the end of this month or the beginning of next month that the road has reached Ganzi [also known as Kandze in today’s Sichuan province] without obstruction, the advance can go ahead. 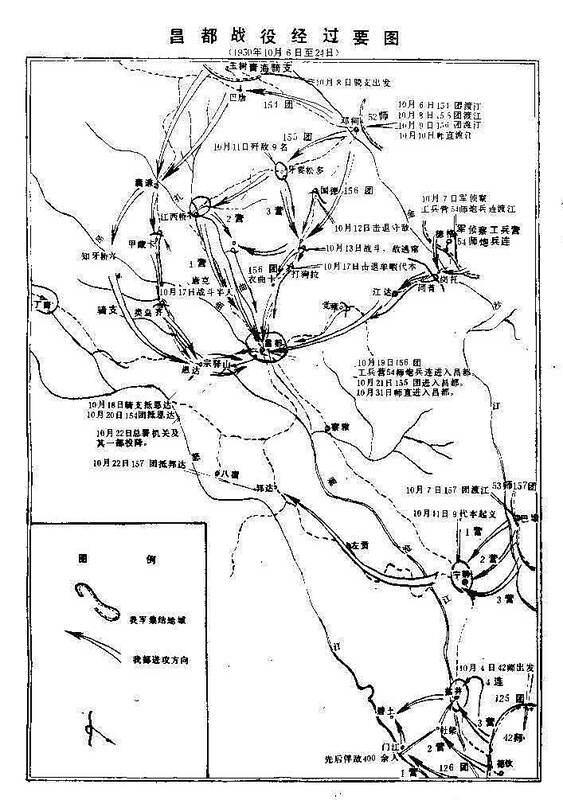 It demonstrates that the east of the Upper Yangtze River, the Communists were not expecting (and they did not encounter later) any ‘obstruction’. Lhasa had then no control over these Tibetan-inhabited areas. It is expected that Chamdo will be occupied in October. That would be advantageous for pushing for political changes in Tibet, and marching into Lhasa the next year. Though Mao knew that the hurdles for the ‘talks’ had been cleared, he was not interested in ‘negotiations’. In order to understand Nehru’s mindset, let us look at a letter addressed by the Indian Prime Minister to C. Rajagopalachari, a Minister without Portfolio in his Cabinet on November 1. The Chinese had entered into Tibet 3 weeks earlier. Rajaji had sent a note to Nehru complaining that the ‘Chinese are deceiving us’. Nehru answers: “Legally our position seems to be a weak one in regard to Tibet,” and adds that morally he finds it difficult to say that the Chinese Government has deliberately deceived India (i.e. Nehru) at any stage. For the last year they have been talking about ‘liberating’ Tibet as a part of the Chinese fatherland. 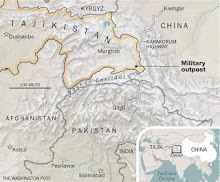 From the 15th of July of this year there has been a great deal of talk on this, and even some Chinese troops’ movements were reported to us on the Tibetan border of China. 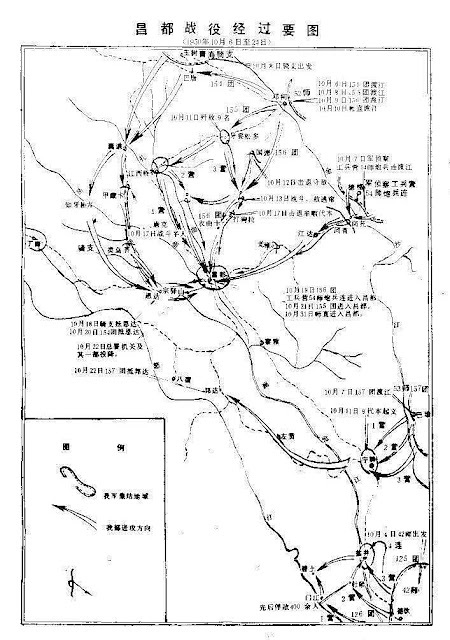 Early in August the Chinese Government issued a text of a proclamation by the Head of their Southern Command [General Liu Bocheng], who was ‘assigned to liberate Tibet’. This proclamation stated that the Peoples Liberation Army will soon march towards Tibet etc. We sent a telegram to our Ambassador asking him to point out that any such move will be most unfortunate and that this should be settled by peaceful means. In this way telegrams have been exchanged repeatedly. 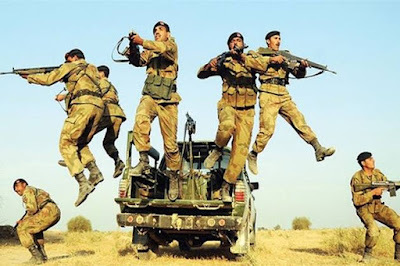 The Indian position was mainly the result of the foolishness of the Indian Ambassador who repeatedly informed Delhi that the Chinese would not use force. The Communists were the worthy children of Sun Tzu and were adept of the Art of War, the ‘negotiations’ trick was just a dilatory tactic to gain time for the Chinese troops to be ready for the battle of Chamdo. They did say that they were always prepared for peaceful negotiations and that they had waited for a long time, but the Tibetan Delegation did not come. According to them, the Tibetan Delegation could not come because of imperialist manoeuvres. None of the Chinese declassified telegrams/reports shows that the PLA was waiting for the outcome of the negotiations. In fact, it was absolutely clear for Mao and his colleagues that the 18th Army had to advance on Chamdo in 1950 itself so that Lhasa and Central Tibet could be ‘liberated’ in 1951. This should have opened the Prime Minister’s (and his ambassador’s) mind to the true intentions and tactics of the Communists. It did not and very unfortunately, the Tibetan issue would get worse when, less than 2 months later, Patel will be gone forever. While understanding the rapidly-evolving situation, Nehru decided to remain passive, with tragic consequences for India. We have to remember also that the Chinese Government and people are living in constant fear of attack by the U.S.A. That fear may not be justified but it is not wholly groundless. Prominent men in the U.S. have repeatedly state that this attack should be made. …If we can put ourselves in China and see Chiang-Kai-shek with a powerful Army sitting nearby to attack China, supported by the U.S., and war coming over nearer and their own territories being bombed, then we can perhaps appreciate the temper and apprehension of the Chinese Government and people. The argument has nothing to do the Chinese troops entering in Tibet, massacring hundreds of Tibetan soldiers and invading a peaceful nation. It is rather flabbergasting that the Prime Minister gives such a long justification on an unrelated topic. Of course, all this does not justify military operations against Tibet, but it does explain many things. Tibet for many years has been under British influence and the British Agent there was violently anti-Chinese. He tried his best to incite Tibetans against China. Previous Chinese Governments have protested against this, and indeed I have myself been told by their representatives. Tibet was thus looked upon as a place which was under British influence. That influence is now gone, but only six months ago the same British Agent was there representing us. This is an absolutely an unfair statement against Hugh Richardson who brilliantly served the Indian interests in Tibet for 3 years (August 1947-1950). Richardson was not only a sharp-minded ICS officer, but also a great lover of Tibet and an outstanding scholar of ancient Tibetan history. Sumul Sinha, Richardson’s successor, was himself one of the finest young Chinese-speaking diplomats; he tried to serve India as well as he could in the difficult circumstances. His services will never be appreciated by Nehru (‘Sinha does not understand our policies’). This is one of the saddest tragedies of modern India. certain considerations which have to be borne in mind to understand why the Chinese Government may have developed a state of mind bordering on fear of what is going to happen, and fear leads to wrong action. I am quite sure that the Chinese Government did not intend to deceive us or to insult us deliberately. It is ironical that Nehru spoke of the Chinese fear, while Mao tries to ‘cool down Nehru’s fears’. When Tibetan representatives arrive in Beijing, we plan to use the Ten Points already decided as the basis for negotiation, urge the Tibetan representatives to sign it, and make the Ten Points an agreement accepted by both sides. 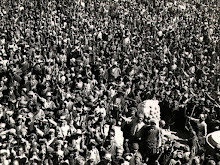 The Ten-Point eventually became the Seventeen-Point Agreement signed ‘under duress’ by Tibetan delegates in Beijing on May 23, 1951. If this can be done, it will make things easier for advancing into Tibet next year. Your plan (the Southwest Bureau’s) to leave 3,000 men in Chamdo for the winter after occupying it, not to advance into Lhasa this year, and withdraw the main force back to Ganzi may be seen by the Tibetans as a gesture of good will. This was the beginning of the Hindi-Chini Bhai Bhai policy. In the process, India lost of ‘buffer zone’ with Communist China and a friendly and peaceful neighbour. The duo Nehru-Panikkar had been taken for a ride by Mao and Zhou. How is one to assess the state visit of a foreign dignitary? After following for two days, the visit of President François Hollande of France in Delhi earlier this week, it was the question I asked myself. In December 2010, when former French President Nicolas Sarkozy came to India; after the ritual signatures of agreements at Hyderabad House, while travelling in the bus taking us back to the Press room, a Press councellor to the President was grilled by the French journalists, they wanted ‘figures’. The official took his pen and started adding ‘figures’ and triumphantly announced ‘17 billion euros’. The bulk of the then total was related to the ‘Jaitapur deal’ for two EPR nuclear plants from Areva of France. More than five years later, many projects, including the EPRs have not yet manifested (though the joint statement during this present visit mentions the possibility for six nuclear plants in Jaitapur). The moral of the story is that there is often a gap between ‘signed agreements’ and the reality of few years later. Things often take more time than expected in India. This raises the question of the ‘Rafale deal’. Let us be clear, President Hollande did not come to India to discuss the change of climate with Prime Minister Narendra Modi, though the Paris conference, for which France worked hard for several months, has been an example of fruitful collaboration. Neither did the French President come to ride to Gurgaon in the metro to inaugurate a International Solar Alliance (with India as one of the main pillars). He also did not spend three days in India to promote Chandigarh, the first ‘smart city’ in India, built by the Franco-Swiss architect Le Corbusier. Mr Hollande came to India to take the next step in the Rafale deal. Fourteen agreements were announced at Hyderabad House after the talks between the Indian Prime Minister and the French President. Listed first was a memorandum of understanding between India and France for the purchase of 36 Rafale aircraft; it was signed by Jean-Yves Le Drian, the French Defence Minister and Manohar Parrikar, his Indian counterpart. Does this mark the end of the tortuous process for the mega deal? No, though the initial Request for Information had been announced in 2001, 15 years ago! Six years later, a complex Request for Proposal was issued by the then Defence Minister AK Antony, who added new clauses and ‘complicated’ the issue. 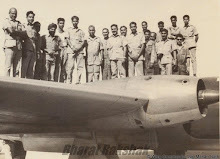 Five years later, Dassault Aviation was selected for supplying 126 planes (with transfer of technology to Hindustan Aeronautics) to the Indian Air Force. Realising the difficulty of the project and to avoid going back to the starting blocks, last April in Paris, Mr Modi opted for 36 planes off-the-shelf. On Monday, commentators were quick to point that the process had not come to a conclusion. Mr Modi and Mr Hollande did not agree on the final contract which should include not only the price of the planes, the cost of their maintenance, the required armament, the training of the pilots and mechanics etc, all this still needs to be finalised. Mr Hollande said it would be done in ‘a few days’; some of his collaborators spoke more prudently of ‘a few weeks’, while Dassault, the constructor announced ‘four weeks’. Will it go the way the 2010 EPR framework agreement between Areva and National Thermal Power Corporation Limited went or will the promises be kept this time? Though the price offered by Dassault and what India is ready to pay still has a wide gap, both sides seem determined to finalise the project as soon as possible. From the Indian side, the IAF immediately needs these two squadrons (while praying for a third one!) and from the French side, though Dassault’s position is radically different from one year ago, being in a better position to negotiate, with an order book full after Egypt and Qatar selected the fighter plane (and with Saudi and Malaysia ready to sign), the French firm would like to conclude the deal. The big change is that after the visit, Mr Modi and Mr Hollande are determined, and this should help to finalise the price and other technical details (according to some sources, there could be an option for 18 more planes); it then could get done during the following months, if not weeks. Several members of the French delegation (including a senior Minister) privately admitted that Mr Modi is ‘different’ from his predecessors; he is a doer ‘with whom we can talk’. 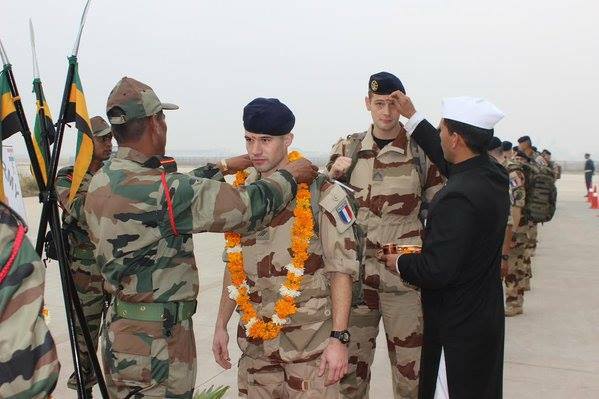 The Prime Minister used his personal charm, not only when he went to receive Mr Hollande in Chandigarh, a symbol of the India-French collaboration, but also when he invited for the first time since independence, foreign troops to participate in the Republic Day parade; these troops were French soldiers of the 35 Infantry Regiment, who had recently participated in the Shakti-2016 joint exercises with the two Garhwal Rifles of the Indian Army in Bikaner, Rajasthan. The 35 Infantry Regiment is one of the most decorated units of the French Army, presently associated with the seven Armoured Brigade. Its 1,200 men and women are famed as the best infantry troops in France. 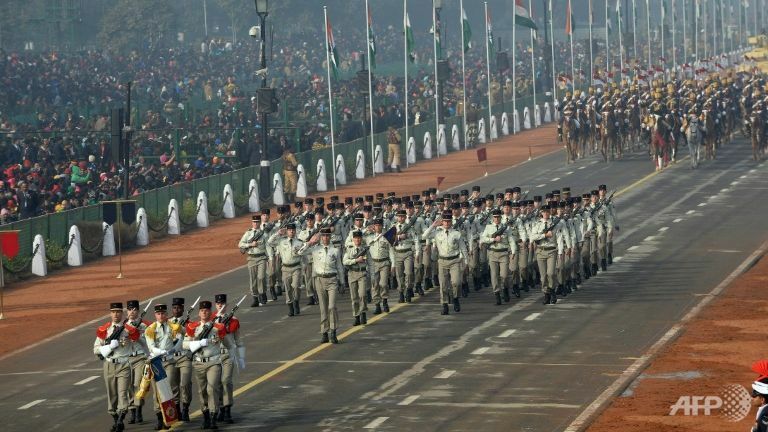 The way the contingent of 76 were cheered by the on Rajpath on the Republic Day, was telling. Another point of closeness is that France, like India, has lately been a victim of terrorism. 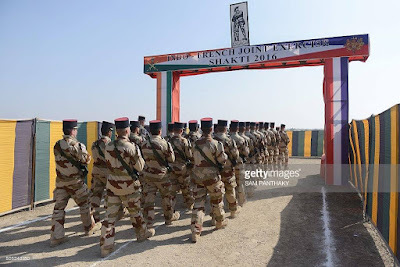 As the French Government was recovering from the November 13 horrific attack and commemorating the killings of several journalists of Charlie Hebdo, the symbol of the French liberté of expression, attackers from the other side of the Indian border, stepped into the Pathankot air base and created havoc for nearly three days. This is indeed a serious basis to take the 1998 strategic partnership to a much deeper level, and in a few months time, the Rafale deal should be the cherry on the cake of a successful visit and a new deeper partnership. One more article on President Hollande's visit to India. I could eventually speak to the French President and what surprised me most was his knowledge of Indian philosophy; he knew about Sri Aurobindo and was very curious to know what a young French man was doing in Pondicherry. Of course, times have changed. Terrorism, not philosophy is on everybody’s mind today; tighter security does not allow one to speak to a President anymore, but in the case of France, the deep bond has remained, even if the exchanges have lately shifted towards security and strategic issues. 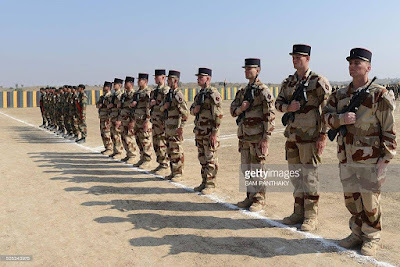 A great symbol of the closeness between India and France is the fact that for the first time since Independence, foreign troops will participate in the Republic Day parade and the soldiers will be French, belonging to the 35 Infantry Regiment, based in Belfort in eastern France. 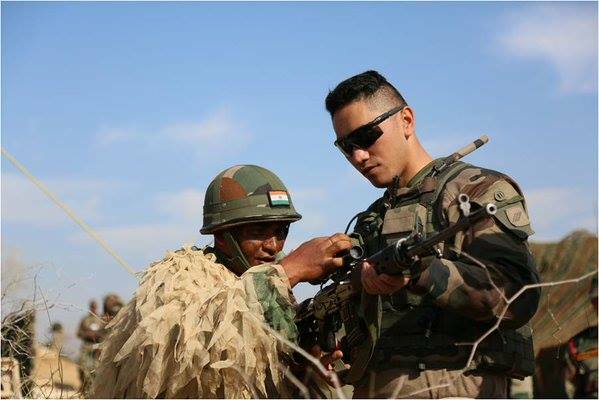 While some participants will come from Afghanistan, others are already in India, where they participated in the “Shakti-2016” joint-exercises with the 2 Garhwal Rifles of the Indian Army in Bikaner in January 2016. The 35 Infantry Regiment is one of the most decorated units of the French Army, presently associated with the 7 Armoured Brigade. 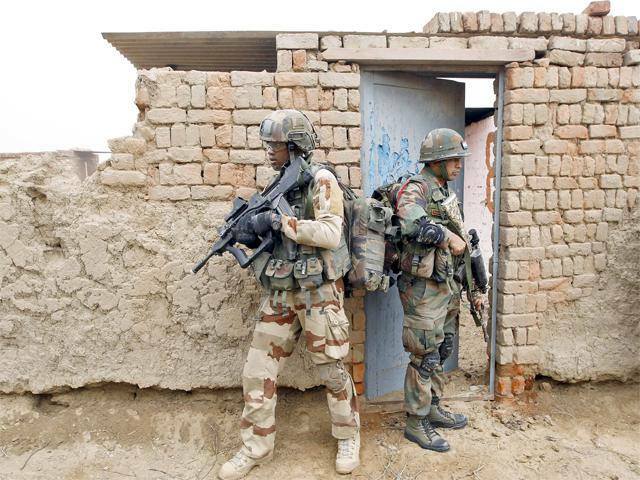 Its 1,200 men often undertake special operations outside the French territory, but also internal security ops. They are famed as the best infantry troops in France and the first equipped with the latest armoured vehicles. 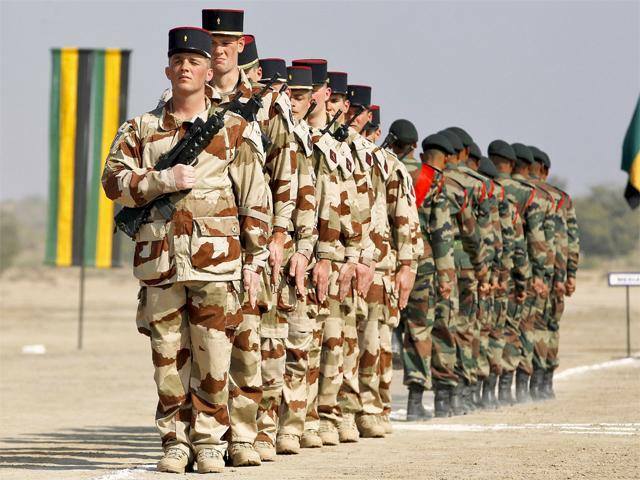 On January 26, India will be reciprocating the honour given to the Indian Army when its troops marched down the Champs Elysees on July 14, 2009 on the occasion of the French Bastille Day. Let us be clear, Mr Hollande is not coming to India to discuss with Prime Minister Narendra Modi Indian philosophy or even the change of climate, though the Paris Conference, for which France worked hard for several months, has been an example of fruitful collaboration between the two countries. 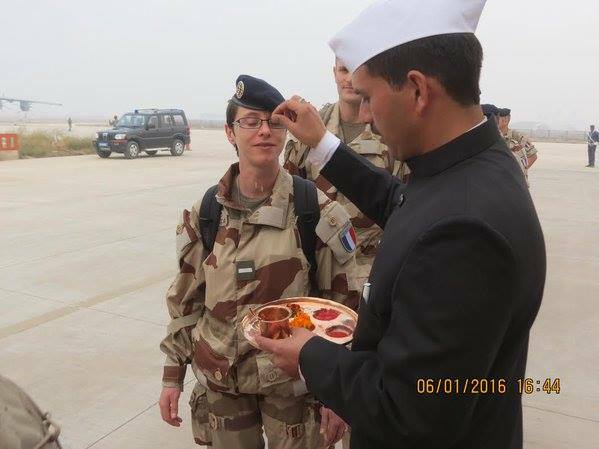 Mr Hollande comes to India to take the next step in the Rafale deal. Of course, France, like India, has lately been the victim of terrorism. The Rafale deal remains nonetheless the raison d’être of the busy French President’s visit to New Delhi. It probably explains the sudden rush of Ajit Doval, the national security adviser, to Paris “to talk about terrorism”. Well, it is doubtful if the NSA’s brief was “terrorism” alone, especially since he cancelled an important “border meeting” with his Chinese counterpart Yang Jiechi. Incidentally, the “philosophical” 1982 visit of Mr Mitterrand triggered the sales of the first Mirage 2000 from Dassault in the mid-1980s. Interestingly, the French have recently rediscovered their old Gaulish belligerent genes. 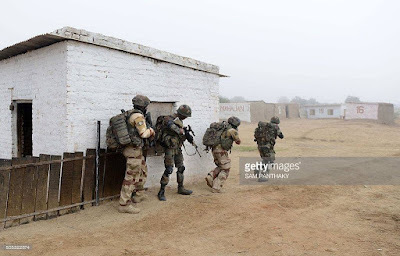 France is today involved in several operations outside its territory (Chammal in Syria, 3,500 men; Sanaris in Central African Republic, 900 men; Barkhane in the Sahel, 3,500 men; Daman in Libya, 900 men, etc.). To this should be added 10,000 Army personnel (Operation Sentinelle) deployed in France after the terrorist attacks on Paris in January 2015. Hopefully, the cultural and other aspects of the relations will also be covered during the French President’s visit. It is significant that Mr Hollande will spend his first day in Chandigarh, the first “Smart City” in India, created by a French man, Le Corbusier. Though “Smart City” has become a fashionable slogan, how many town planners are today ready to follow in the steps of Le Corbusier? Creative minds are today required to make the scheme a success. Why can’t France, which has committed loans of two billion euros over the next three years to support smart cities and sustainable development in India, participate in new Chandigarhs? Solar energy is also a field where France and India have decided to work together. An International Solar Alliance was launched in Paris in November 2015. Its secretariat will be hosted in the premises of the National Institute of Solar Energy in Gurgaon. “This day is the sunrise of new hope — not just for clean energy, but for villages and homes still in darkness; and for our mornings and evenings filled with a clear view of the glory of the sun,” said Mr Modi at the launch of the alliance in Paris. And what about a train à grande vitesse (bullet train) between the city of Le Corbusier and the Indian capital? That would be very smart. My article France and India join forces for smart cities and smarter relations appeared in Mail Today. Terrorism will be another topic that will be hotly discussed, as both India and France have been victims of terror attacks. 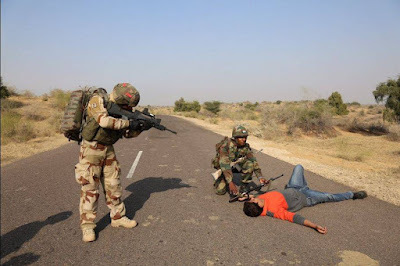 As France started to recover from the November 13 attacks and was commemorating last year’s killings of several Charlie Hebdo journalists, attackers from the other side of the Indian border slipped into the Pathankot airbase and created havoc for nearly three days. For the French president, this visit to India is also significant at a time his popularity is again tumbling (12 points in one month, according to Le Figaro), despite a surge following November 13. While terrorism and the Rafale deal will be the plat de resistance (‘the main dish’), the hors-d’oeuvre (‘appetiser’) will be Hollande’s visit to Chandigarh, one of townships selected by the Indian government to be a ‘smart city’. But contrary to other Indian cities, Chandigarh was born ‘smart’. In the Indian public’s mind, the city remains synonymous with Le Courbusier, the Franco-Swiss architect who had the vision of a city with a difference. Several letters of Le Corbusier recently published by the Nehru Memorial Fund give us an idea of the architect’s long march towards the fulfilment of his mission and the difficulty to match his dream with India’s reality. It was the beginning of a long, though at times painful, odyssey. The architect, as well as the Indian government, soon learnt that smartness does not come in one day - and without intense labour pains. Will it be different 60 years later? During Chandigarh’s painful delivery, Le Corbusier was often discouraged, as strident critics kept appearing and obstructions accumulated. 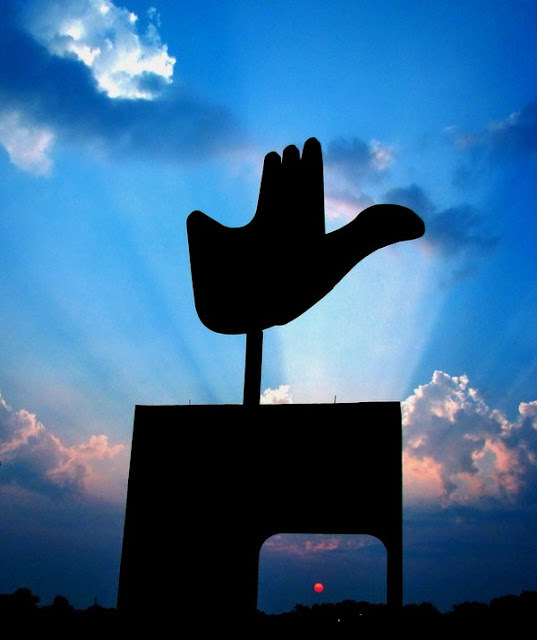 The ‘Open Hand’ was finally installed in 1985, even though Indira Gandhi had sanctioned funds for the art piece in December 1972. The moral of the story: everything takes time in India, even smart projects. 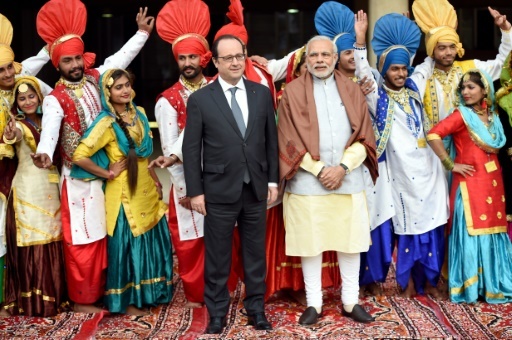 Hollande’s first stop will be in Chandigarh, where he will be received by the prime minister. India would like to make Chandigarh ‘smart’ according to today’s norms, and France is ready to help. Paris has already informed Delhi of its willingness to participate in the ‘smartisation’ of three cities - Puducherry, Nagpur and Chandigarh. France is ready to offer a line of credit of 2 billion euros through its Agence française de Développement (French Development Agency) and to bring in French creativity and expertise. If not extravagant heads, creative heads will be required to make Modi’s pet project a success. France will hopefully be by India’s side. A telling symbol of the closeness between India and France is the fact that for the first time since Independence, foreign troops will participate in the Republic Day parade and the soldiers will be French, belonging to the crack 35th Infantry Regiment, based in Belfort in Eastern France. A train à grande vitesse (bullet train) between the city of Le Corbusier and New Delhi, as well as some mega solar energy collaboration, are also on the cards. That would be very smart. Rafale M on the menu? While the Rafale deal seems to be the main order of business during French President Francois Hollande's visit, other aspects could help sweeten the deal, says Claude Arpi. There was a time when head of States could leisurely travel abroad and spend a couple weeks visiting one or two friendly foreign countries. The times have changed. Like CEOs, they fly for a meeting at one corner of the planet and rush back the next day to deal with the complexities of domestic issues. Francois Hollande is no different. Well, let us be clear, Hollande does not come to discuss the weather with Prime Minister Narendra Modi. The outcome of the Paris Conference, for which France worked hard for several months, was vague enough to leave to each country to be a good pupil if it wants, and to fulfill its promises. Hollande comes to India to take the next step in the Rafale deal; of course, France like India has lately been the victim of terrorism. My article A Talk with Hollande appeared today in the Opinion Page of The Statesman. The French have recently rediscovered their old Gaulish belligerent genes. The list of France’s present military intervention outside its territory is long and the locations spread over two continents: Africa and the Middle-East. 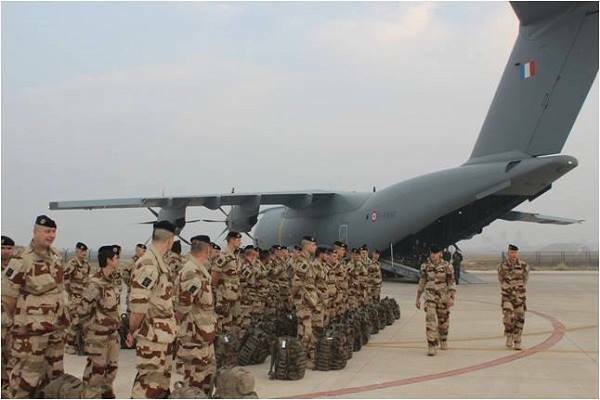 French troops are deployed in Syria (Ops Chammal, 3.500 men); in Central African Republic (Ops Sanaris, 900 men); in the Sahel (Ops Barkhane, 3.500 men); in Libya (Ops Daman, 900 men); it is a lot for a country like France. To this should be added, 10,000 army personnel (Ops Sentinelle), participating in the security measures accompanying the state of emergency declared after the Paris terrorist attacks in November. While France has been at the forefront of the battle against ‘terrorism’, waging a long war against Al-Qaida and the Islamic State, Delhi too has for years had firsthand knowledge of terrorism, though in India’s case, the terror often comes from a neighbouring country; the country has not been engaged in outside military operations after the sad Sri Lankan episode. 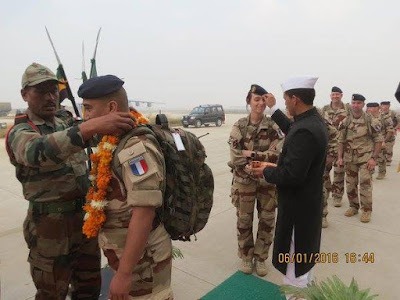 This shared concern between India and France for terrorism, is one of the reasons why in December 2015, it was announced that President Hollande would be the Chief Guest on the occasion of the Republic Day celebrations: “This invitation conveys the excellent quality and dynamism of the strategic partnership between India and France, which will be further strengthened on this occasion. This visit will also follow on from the Paris Climate Conference, at which India played a decisive role in reaching an ambitious agreement,” said the brief communiqué from the French Presidency. The French government was just recovering from the November 13 horrific attacks in Paris and was commemorating the killings of several journalists of Charlie Hebdo in December 2014, when attackers from the other side of the Indian border, stepped into the Pathankot airbase and created havoc for nearly 3 days. Terrorism, security and strategic dialogue will dominate the visit of the French President in Delhi, although it is clear that Hollande comes to India first and foremost to take the next step in the Rafale deal. During the last few weeks, both sides have been zealously working to seal an agreement on January 25, when the French President meets with Prime Minister Narendra Modi. President Hollande may also discuss the realizations of Le Corbusier, the French architect who built Chandigarh in the 1950s and 1960s or even the change of climate, for which France worked hard for several months in preparation of COP21 in Paris, but it will not be the main dish of the visit. The sudden rush of Ajit Doval, the National Security Advisor to Paris ‘to talk about terrorism’, was part of the efforts to make the Republic Day a real success. During his talks in Paris, the NSA’s brief was not only ‘terrorism’, but the purchase of 36 Rafales for the Indian Air Force. Hardly five days after Doval’s return to Delhi, Le Drian is to fly to Delhi to ‘save the deal’ or ‘fine-tune the agreement’, depending on the optimism of the analyst. One positive sign is that the Modi Sarkar recently reinstated with immediate effect, 'services' as an eligible option for offsets in defense deals. The Government amended the 2013 Defense Procurement Procedure (DPP-2013) just before the release of the revised DPP-2015. It should be helpful to sort out the differences between Dassault Aviation and the Indian government over the offset obligations of the former. The Rafale deal is indeed the raison d’être of the busy French President’s visit to New Delhi and it is vital for his failing popularity in France, while it also important for Narendra Modi’s credibility. 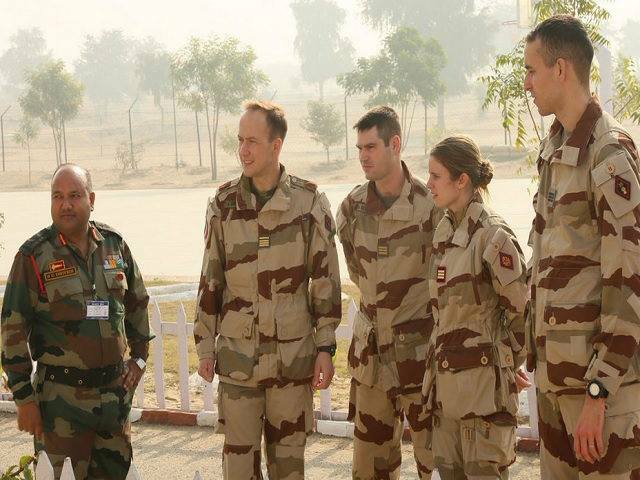 A telling symbol of the closeness between India and France is the fact that for the first time since Independence, foreign troops will participate in the Republic Day parade and the soldiers will be French, belonging to the 35th Infantry Regiment (35 RI), based in Belfort in Eastern France. While some participants will come from Afghanistan, others are already in India, where they participated in the Shakti-2016 joint-exercises with the 2 Garhwal Rifles of the Indian Army in Bikaner. The 35 RI is not an ordinary regiment! Presently associated with the 7 Armoured Brigade, it is one of the oldest French regiments, created in 1604. During its long history, the regiment was renamed several times, i.e. Anjou (in 1671) and Aquitaine (in 1753); later it participated in Napoleon’s campaigns and earned laurels for its heroic actions during the battle of Wagram in 1809 and the Russian campaign in 1812. The regiment carries four citations on to its flag earned during WWI: Alsace-The Ourcq in 1914, Champagne in 1915, Verdun in 1916 and Reims in 1918. 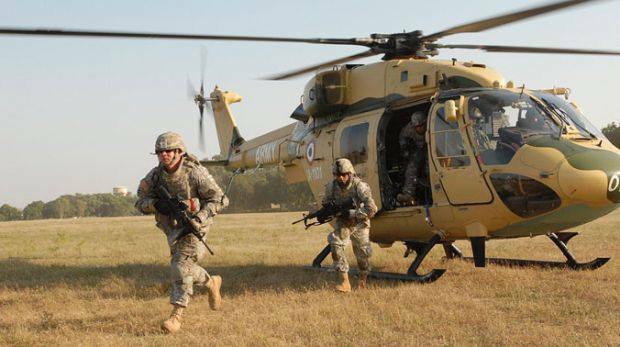 More recently, the 35 RI was engaged in external operations in places like Afghanistan, Lebanon, Ivory Coast, Kosovo, Chad or Centre African Republic; the 35 RI has also been extensively used for internal security ops in France. It is not only the best French infantry regiment, but also the best equipped unit with the latest gadgetry in its armoured vehicles. Its 1195 members are known as ‘les gaillards’, which could be translated as ‘the tough guys’ (though female jawans also serve in the 35 RI). India is reciprocating the honour given to the Indian Army when its troops marched down the Champs Elysees on July 14, 2009 on the occasion of French Bastille Day. But that is not all; India is in the process of finalizing an order for three more French Scorpene submarines, after the construction of the first six presently built at the Mazagon Docks is completed. Next year, Delhi should issue a tender for six new-generation stealth submarines; France is on the ranks for the tender. Navy chief Admiral Robin Dhowan recently announced: “[our] aim is to ensure the islands are not only well protected but also act as a strategic location for basing aircraft, warships and submarines. The proximity of A&N Islands to Malacca Strait makes them very strategic since they overlook busy sea lanes and choke points." Here too France would like to be on India’s side. Hopefully, the cultural and other aspects of the relations will also be covered during the French President’s visit. It is significant that Hollande will spend his first day in Chandigarh, the first ‘Smart City’ in India, created by a French man, Le Corbusier. A train à grande vitesse (bullet train) between the city of Le Corbusier and the Indian capital, as well as some mega solar energy collaboration is also on the cards. That would be very smart. 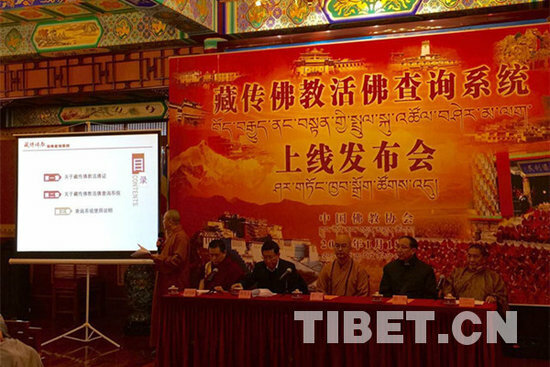 In April 2015, the State Council Information Office published a White Paper on Tibet. It was entitled “Tibet's Path of Development Is Driven by an Irresistible Historical Tide”. 358 rinpoches in an atheist country was surprising. However a month later, on May 21, 2015, an article, Fake Lamas flourish as China's middle class grows, in China.org gave different figures. Being probably adept of the Middle Path, the Chinese Buddhist Association has now announced that 870 Rinpoches have been ‘verified’, for whatever ‘verified’ means. On January 18, a new search engine was launched, at the Guangji Temple in Beijing by officials of the United Front Work Department and the Buddhist Association of China. Users can check information on their Rinpoches via the Internet. But why having announced 358 Rinpoches in April and now have a database of ‘at least’ 870 'living Buddhas'? The Communist Party seems very confused when it deals with ‘reincarnations’. Drukhang (3rd left), a 'real' rinpoche? The article does not say if Drukhang himself is included in the database. What about the Dalai Lama and the Karmapa Ogyen Dorje? The State Administration for Religious Affairs affirmed that "anybody claiming to be a living Buddha who is not on the list should be considered a fake." The South China Morning Post checked and the Dalai Lama is not on it. The search engine has eight categories of information: name, religious name, Buddhist name, date of birth, religious sect, Buddha permit number, monastery and a photo. What is the Buddha Permit Number remains a mystery? Is it the rinpoches’ Party Card number? A mobile app for the search engine, in case if you have an android phone, is available. However to search the database for a living Buddha, you have to provide a mobile phone number and only after receiving a verification code, you will be able to start your search. Further, a limit of only five searches per day is allowed. In other words, it will take you half a year to search the entire database. It added that Rinpoches approved by the government have already received the certificates. It is not mentioned if there is a possibility to apply online if one wants to register as a rinpoche. A few weeks ago, The New York Times published a stunning photo feature on a horse festival held in the Batang Grasslands, near Jyekundo in Eastern Tibet (today Qinghai province of China). Yushu, as the town is known in Chinese, is a special place. In April 2010, the Yushu earthquake made world headlines. With a magnitude of 6.9 on the Richter scale, the quake killed nearly 3,000 people, while 12,135 were injured. Ninety percent of the houses and public buildings were destroyed. The December horse race was attended by thousands of nomads, monks and traders; while many deduced that the high plateau was witnessing a revival of the Tibetan culture, others realized that it is just a clever move bythe Chinese. Those who attended the race could not miss the heavy presence of the Peoples’ Armed Police Force, constantly patrolling in the midst of the Tibetan crowds. Though joy and excitement could be seen on the faces of the Tibetan participants and spectators, everyone knew that the festival was ‘watched’. But for outsiders, the festival showcased a new China promoting the culture of the ethnic minorities, “that of dancing, singing, happy-go-lucky, costume-wearing, loyal citizens of the nation,” said The New York Times. The phenomenon is not new; it is in fact a conscious policy decided during the Fifth Tibet Work Forum held in Beijing in January 2010. Work Forums are large meeting attended by several hundreds of officials, including all the members of the Standing Committee of the Politburo, local satraps, senior PLA and PAPF officers, planners, etc. During these Forums, China’s Tibet policy is decided for the following 5/10 years. The most recent one, the Sixth Tibet Work Forum, was held in August 2015. However knowing that the imposition of Mandarin could have severe backlashes on the Tibetan plateau, as demonstrated by the unrest in March/April 2008, the Chinese government has decided that ‘minorities’ languages could be included in the curriculum in some cases. Similarly, Tibetan culture can be promoted under the Party’s close watch, most of the time with Chinese characteristics. A ‘Cloud Tibet’, China's first Tibetan search engine has the same objective; Xinhua recently reported its forthcoming release during the second half of 2016. According to the head of the project, one Tselo, the database and the semantic unit function are already running. Xinhua said that the venture was launched in April 2013 and more than 150 people have been working on it at the Tibetan language research center in Hainan Tibetan Autonomous Prefecture in Qinghai Province. Tselo also affirmed: “The recognition rate is over 95 percent." The project is part of a larger scheme: Beijing has decided to promote tourism on a mega scale in Tibet is order to ‘promote’ Tibetan culture, bring more revenue to the local population and assimilate Tibet once and for all, …while providing entertainment to the Han masses. So many birds with one stone. For centuries, Tibet has been the most isolated country on the planet. A few brave explorers managed to sneak in, most of the times illegally on the Roof of the World. Today, the Chinese propaganda thus describes the plateau: “Tibet with its mystery is the spiritual Garden of Eden and is longed by travelers home and abroad. Only by stepping on the snowy plateau, can one be baptized by its splendor, culture, folklore, life, snow-mountains, saint-mountains, sacred lakes, residences with local characteristics and charming landscape”. Tibet is fast becoming the largest entertainment park in the world, thousand times larger than Disneyland. Beijing has decided to market the Land of Snows as the ultimate ‘indigenous’ spot for the Chinese people to spend their holidays. In the process, Tibetan culture and language are sometimes promoted. Tibet has two unique assets: first, its physical reality. The beauty of the landscape, the imposing mountain ranges, the purity of the air and the rivers, the dry blue sky (especially when compared to the dark sky of China’s great metropolis); Tibet is indeed the ideal place to have a break from the fast pace of the polluted mainland of China. The second advantage is the rich historical past of the Roof of the World, the Land of the Lamas. In Tibet, you can find everything, says the Chinese propaganda: a beautiful Chinese princess falling for the powerful emperor and converting him to Buddhism; monasteries and nunneries, seat of a wisdom lost; folkloric yak or snow-lion dances; ‘ethnic’ festivals; beautiful colourful handicrafts; exotic food, you name it, …and thousands of Tibetans who can guide the crowds through the mega-park/region. The most grandiose of these entertainment projects is the ‘Grand Princess Wencheng Opera’; an opera on the life of the Chinese wife of the Tibetan Emperor Songtsen Gompo, who lived in the 7th century CE. Staged at the outskirts of Lhasa, the opera has proved to be a stunning success with the Han tourists. It is said to be performed 180 times every season. Some 600 actors perform on a nearly-100 meters long stage, in front of a newly-built Potala Palace, a few kilometers from the real one. Beijing uses China’s ‘historical records’ to tell the Han tourists the history of Tibet, as Beijing sees it. ‘Two areas’ are Tibet and China, two separate entities at the time of Songtsen Gompo, who invaded China during his reign (this is of course forgotten by Beijing). Can you guess in which language the opera is performed? In Putonghua or Mandarin of course! It says it all. Pouring 20 millions of ‘tourists’ (this is the official figure for 2015) into a relatively small place like the Tibetan Autonomous Region, requires to be ready to provide ‘good entertainment’. That is why the local Tibetan government organizes ‘festivals’ such as the Lhasa Shoton (yoghurt) Festival or the Yushu Horse Racing Festival. Xinhua explains that during the Shoton festival, “there are celebrations in the streets, squares and monasteries in Lhasa”, though the main venue is the Dalai Lama’s Summer Palace, the Norbulinka. At the same time, the ‘D’ word is banned on the plateau! A few days ago, Xinhua announced that Tibet will have ‘20 distinctive towns’ in the next three years, “making them exemplary areas for comfortable living, work …and tourism”. Comfortable for whom? Undoubtedly for the Chinese tourists. Early this month, the first of such cities was inaugurated in Gongkar County, near Lhasa, “[these] towns will stick to the principle of prudent cutting of trees, no digging of mountains, no filling lakes and little destruction of houses,” says Xinhua. Good, but Tibet has already become the Disneyland of Snows …with Chinese characteristics. This makes the situation far more dangerous for the future of the Tibetans, if they want to preserve their distinctiveness. Unfortunately, the Middle Way of the Dalai Lama does not cater for the new dangerous trend. Hong Kong ( ‘Fragrant Harbour’) was to be a model of governance, it may not be. In 1997, the territory’s transfer of sovereignty from the British Crown to the People’s Republic of China marked the end of 156 years of ‘imperialism’ for the Communist leadership, while for the British, it signalled the disappearance of the last remnants of their Empire. Hong Kong became China’s Special Administrative Region, governed by a principle known as ‘One Country, Two Systems’, a genial brainchild of China’s paramount leader, Deng Xiaoping, who thought that the recipe could later be applied to Taiwan, the ‘rebel island’. 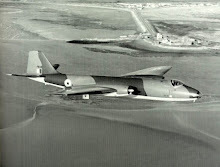 But recently, the scheme has again shown its limits. The Sino-British Joint Declaration of 1997 had provided Hong Kong with ‘a high degree of autonomy in all areas except defence and foreign affairs’, while the territory’s political and judicial systems could continue to function independently from those of the mainland. The guarantees for Hongkongers’ individual rights and freedoms were enshrined in the Hong Kong basic law, the territory’s ‘Constitution’. Today, the entire system is in jeopardy due to some strange events. What has happened? When in late December, Mr Lee Bo, a bookshop owner and publisher in Hong Kong went missing, his wife filed a police complaint saying that he had “disappeared”. Soon after, alarm bells started ringing louder: Four of Mr Lee’s colleagues — Mr Gui Minhai, Mr Cheung Ji-ping, Mr Lui Bo and Mr Lam Wing-kei — were also untraceable. Mr Lee Bo was last seen in the Chai Wan warehouse of his Mighty Current publishing house which specializes in books banned on the mainland, often revealing the latest secrets about the Party’s apparatchiks. According to some rumors, Mr Lee Bo who had specialised on books about the Chinese President, was working on a ‘private life’ of Mr Xi Jinping? Tricky business; one can understand that it was not really appreciated in Beijing, which in the recent months has greatly tightened its grip on Internet and literary freedom in general. Political and gossip books on the Chinese leadership have been a lucrative business for Hong Kong booksellers as mainland visitors are avid readers of ‘censured’ literature, unavailable at home. 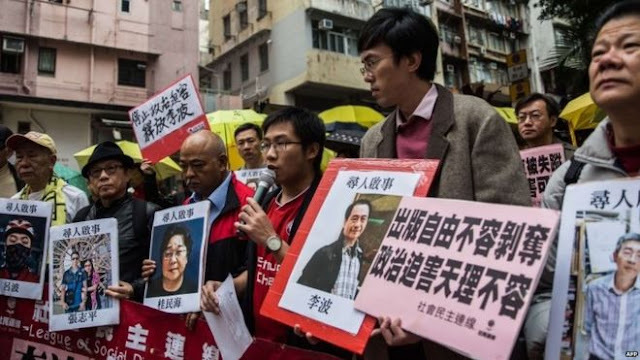 Mr Lee Bo could have been abducted to intimidate other publishers distributing ‘messages unfavourable to China’s ruling regime’, says the Hong Kong newspaper. Beijing has always believed in the saying, “Kill a few chickens to scare the monkeys”. What exactly happened to Mr Lee Bo is not known, but in a note to his wife, he said that he was in China mainland assisting some ‘investigations’, since then, his wife has withdrawn her case. The issue has taken a serious political turn as Hongkongers are particularly attached to their special status and freedom of expression. Remember the ‘Occupy Central’ movement in September 2014, when tens of thousands of Hongkongers took to the streets in the former British colony to pressure Beijing to keep its promises. In 2004 already, Beijing had warned that it would have to ‘approve’ of any changes to Hong Kong’s election laws. Ten years later, the pro-democracy activists fought to make the second part of Deng’s scheme, ‘One Country, Two Systems’ as important as the first. Beijing unfortunately believes that ‘one country’ is paramount. Hong Kong’s Chief Executive Leung Chun-ying joined the fray and warned: “It is unacceptable for mainland law enforcement officers to carry out duties in Hong Kong, because it does not comply with the basic law.” The basic law clearly guarantees not only a high level of autonomy, but also freedom of speech, rule of law and judicial independence. To further complicate the situation, Mr Lee Bo is a British passport holder. During the same Press conference, China’s Foreign Minister Wang Yi did not answer directly a question on whether the ‘missing persons’ were under Chinese detention, but he asserted that, even if Mr Lee Bo held a British passport, he was ‘first and foremost a Chinese citizen’. In a recent editorial, The Global Times articulated Beijing’s position: The booksellers were exercising an ‘evil influence in China through their political publications’. The tabloid went further; it argued that it was reasonable for Chinese law enforcement agencies to “circumvent the law when they seek cooperation from an individual for investigation.” Quite frightening! The Global Times suggested it was legal for the Chinese authorities to probe Causeway Bay Books, as it publishes and sells political books targeting mainland readers and “creates special interference to the maintenance of order in the mainland”. The same editorial said it was fine to use means to “get around local laws …and make one comply with their investigations without breaching systemic bottom lines”. What ‘breaching bottom lines’ means is not clear, but Beijing probably feels that the basic law is ‘first and foremost a Chinese law’. On January 10, tens of thousands demonstrators gathered outside Government headquarters in Hong Kong, where the pro-democracy protests were held in 2014; they shouted slogans such, ‘Release Hong Kong Booksellers Now!’ or ‘Today’s Lee Bo is you and me tomorrow’. But will Beijing listen? Today, while the younger generation in Hong Kong is certainly not ready to become another of China’s ‘minorities’, the question is also vital for the future of ‘greater China’. While Taiwan will certainly watch carefully the unfolding of the situation in Hong Kong, in Tibet, Xinjiang and Inner Mongolia, the populations also aspiring to ‘another system’ too will follow the Hong Kong events closely. Yesterday, President Xi Jinping announced the reorganization of the four PLA military headquarters or departments - staff, political, logistics and armaments - into 15 new agencies which will directly work under the Central Military Commission (CMC). Xi Jinping, who also CMC Chairman, met the new bosses of each unit. He described the reshuffle as ‘a breakthrough’ and ‘a crucial step’ toward a stronger military. Xi added that all the military leaders should adhere to the Party spirit, obey political discipline, and be politically intelligent (sic)! Xi urged the new leaders to ‘frequently, actively and resolutely’ align their direction with the CPC Central Committee and the CMC. As mentioned earlier on this blog, the seven Military Area Commands are being replaced by five Combat Zones, primarily focusing on 'combat'. The new Western Combat Zone will replace the two Military Area Commands today facing India in the High Himalaya (Chengdu and Lanzhou). According to The South China Morning Post, General Zhao Zongqi will command the Western Combat Zone. I re-posting an old piece on General Zhao. That was a good prediction. General Zhao should automatically become member of the CMC. General Zhao Zongqi: from Tibet to the CMC? A couple of years ago, I wrote a piece The Chinese who matter in Tibetan Affairs. Since then, several officials who ‘mattered’ have lost their job or have disappeared from the Chinese political scene. 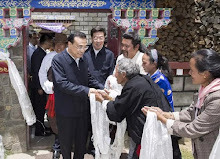 The prime case is of course Ling Jihua, who from 2007 to 2012 served under President Hu Jintao, as Director of the General Office of the CPC Central Committee and in 2012, became Head of the United Front Work Department, dealing with Tibet among other subjects. His son's car accident (with two Tibetan girls) signaled the beginning of his downfall. Jia is now investigated for six violations of law and Communist Party discipline, including taking bribes, adultery and illegally acquiring a large number of ‘core secrets’ of the State and Party. It is what a Politburo statement, relayed by Xinhua, said. The South China Morning Post rightly says: “The accusation that Ling illegally obtained the secrets surprised some observers, who said he was supposedly entitled to access to the information”. This is one of the mysteries of Chinese politics. Another Chinese who matters(ed) is/was General Wang Jianping, a member of the 18th CCP Central Committee. 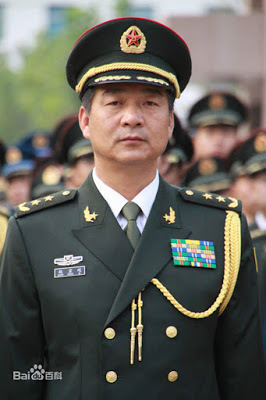 In 2009, he became Commander of the Chinese People's Armed Police Force with a bigger budget than the PLA. Apparently, in January 2015 Wang was ‘transferred’ as deputy head of a coordinating group on military training; it is obviously a great fall. The article says that Xi has assigned several senior military generals to insignificant positions: "Over the last six months, those in the most important leadership positions in the armed forces have all been replaced. Those officials who were close to Xi were promoted." Wang Jianping is one clearly one of those who lost their seat. Another powerful figure who has disappeared from my list is Lieutenant General Yang Jinshan. In October 2014, I wrote about The Fall of a Powerful General. His fall is probably related to Xu Caihou’s case. He was even demoted from the Party's Central Committee. And there is also the case of Le Dake, the head of External Intelligence in Tibet. A few weeks ago, Reuters had reported that the former top Chinese security official in Tibet was being investigated ‘for suspected graft’. While some officials have sunk into oblivion, some are rising very fast. 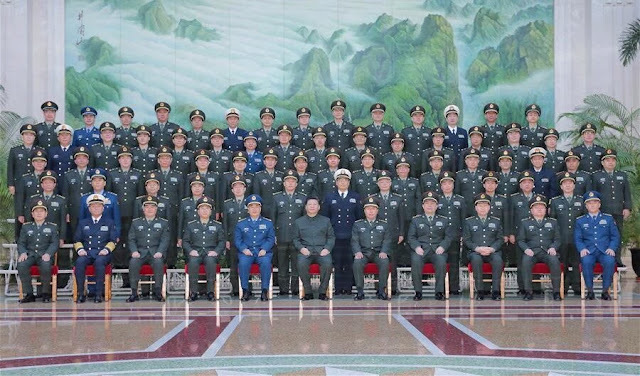 It is the case of the Jinan Military Region’s Commander, Lieutenant General Zhao Zongqi, who, earlier in his career spent 20 years in Tibetan Military District. Recently, General Zhao went on an inspection trip with General Fan Changlong. 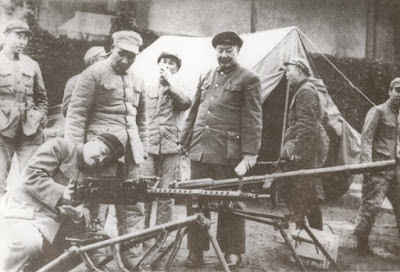 According to The PLA Daily, Lieutenant General Zhao Zongqi accompanied Fan to inspect garrisons in Gansu, Xinjiang and Ningxia. His long stint in Tibet is not mentioned. 'Higher rank' can only mean 'Central Military Commission'. Last year, I mentioned on this blog a high level tour of General Fan Changlong in Tibet. He was then accompanied by three Military Region Commanders (Lt. Gen. Liu Yuejun, commander of the Lanzhou Military Region, General Li Shiming, Commander, Chengdu Military Region and Lt. Gen. Zhao Zongqi, Commander, Jinan Military Region). I then wondered what was the Jinan MR Commander was doing there. This was soon after the Chumur incident in Ladakh during the visit of President Xi Jinping in India. At that time, Xinhua reported that General Fan told the army to firmly obey the command of President Xi Jinping and the Communist Party of China (CPC) Central Committee. One of the ‘Four to Ask’ was “To ask oneself whether one follows the correct guiding ideology in training, whether the practices followed are correct to [avoid] other negative phenomena [i.e. corruption?]”. Apparently General Zhao got it right; he probably answered the question the correct way. As the result, he may soon be the first Chinese ‘Tibet hand’ reaching the PLA’s Heaven (the Central Military Commission). My article Return to the Stilwell Road: Reopening a mythical trade route appeared in Mail Today. The route is said to have been used during the 13th century invasion of Assam by the Ahoms, and in the late 19th century, the British pondered a railway line to Myitkyina in north Burma through the Hukawng Valley, but the project never materialised. A year ago, MoS for Home Kiren Rijiju mentioned the reopening of the Stillwell road: “After the Stillwell Road was closed in 1962, the movement of border trade was restricted. Re-opening this road would open up numerous options,” Rijiju asserted. The reopening today is mainly symbolic, as many other considerations have to be taken into account to start trade on a large scale. One of them is that Delhi may presently like to go slow on the ‘BCIM’ corridor. The issue was apparently raised by Chinese President Xi Jinping during his visit to India in September 2014, but only a passing reference was made about the BCIM Economic Corridor in the Joint Statement. Perhaps one of the greatest tragedies of the 20th century has been the closing of the border trade through the Himalayan routes. 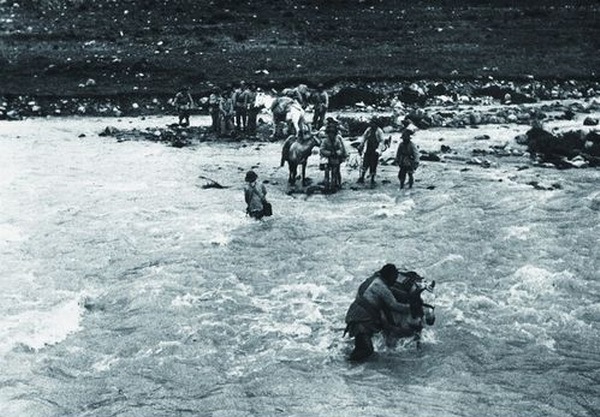 Soon after Tibet’s invasion in October 1950, the traditional border passes were progressively closed. Though the Panchsheel Agreement in 1954 was meant to regulate the flow of people and goods over the Himalayas, it did not happen and as a result of the 1962 border war and the non-renewal of the Agreement, trade between ‘Tibet’s Region of China’ and India came to an end. 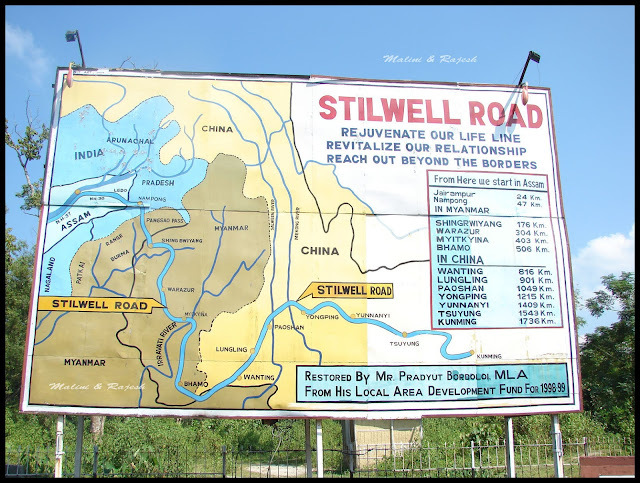 The same fate lay in store for the Stillwell Road. It is only after prime minister Rajiv Gandhi’s trip to China in December 1988, that a ‘Protocol for Resumption of Border Trade’ was signed. 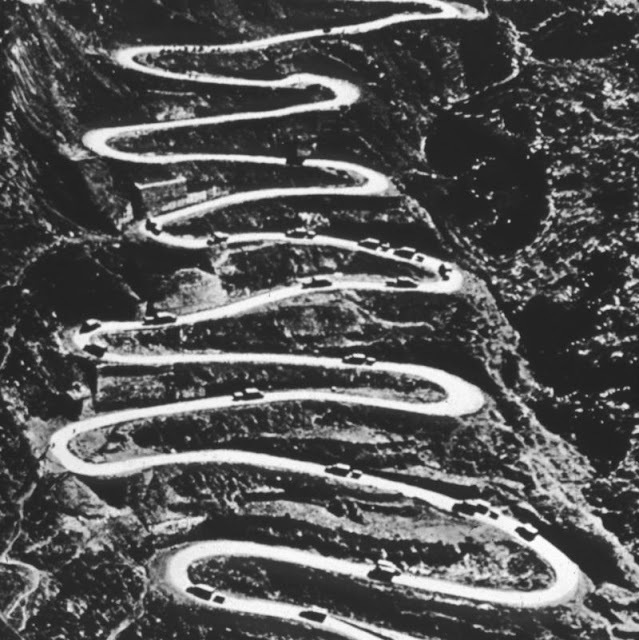 Following the Sino-Indian agreement of 1992, trade through Lipulekh Pass in Pithoragarh district became an annual feature. The pass also became the official pilgrimage route for the Kailash-Mansarovar yatra. Shipki-la, in Kinnaur district of Himachal Pradesh was the second landport to open. However, the poor quality of the infrastructure and the limited list of permissible items has restricted the border trade which flourished for centuries. After PM Vajpayee’s visit to China in June 2003, talks started on the resumption of border trade via Nathu-la in Sikkim. Finally, the pass opened for trade in July 2006. Pangsau Pass has become the fourth Himalayan pass to open for trade. Though trade may remain small-scale for some time, it is an important step for normalising the relations between the concerned countries. And one day, it will hopefully bring some prosperity to the local populations of Arunachal and Assam. 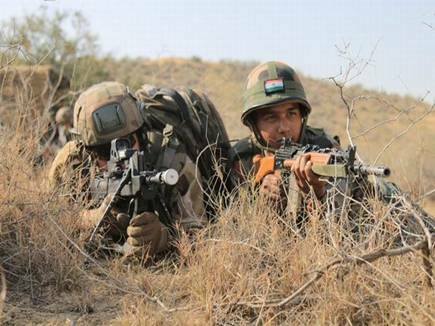 My article China’s PLA sings Jai Ho as India goes for Border Defence appeared in NitiCentral. On New Year day, a Border Personnel Meeting (BPM) between India and China was held in a Chinese hut near a place called Damai, north of the Lohit sector of Arunachal Pradesh. 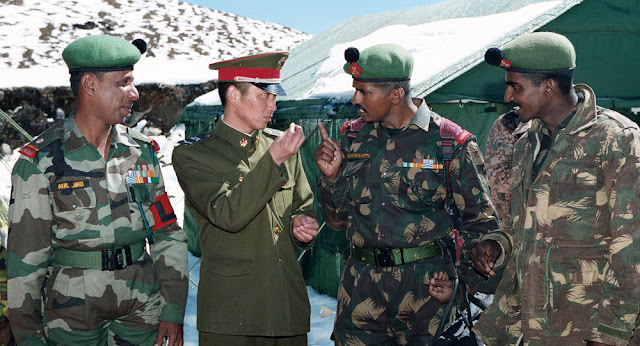 The Indian delegation was led by Brigadier S.S. Bhogal, who commands a brigade in the area, while China was represented by Senior Colonel (equivalent to a brigadier) Hu Xiao Bao, commanding the Zayul Garrison of the Chengdu Military Area Command. Then, Chinese women performed some ‘scintillating dances’, while male soldiers of the People’s Liberation Army (PLA) gave a feel of their voices. The report speaks of growing bonhomie and brotherhood between the armies of the two nations. But in view of past history, one should remain guarded, especially when Indian newspapers get carried away with too much ‘brotherhood’. Remember the Bhai-Bhai days? It is certainly better to dance and sing together, than to sponsor terrorism across the border, like another of India’s neighbours does. Far away from the Lohit valley, Indian and Chinese border officials also met in Ladakh ‘to improve ties at the functional level’. The Moldi Garrison in Chushul sector of Ladakh witnessed a BPM in a ‘free, congenial and cordial’ atmosphere; Brigadier Vijyant Yadav was seen shaking hands with PLA’s Senior Colonel Fan Jun. The Northern Command’s spokesman Colonel S.D. Goswami told the Srinagar-based Daily Excelsior that this reflected the mutual desire of the 2 countries “to maintain and improve relations on the borders at functional level”. Another encounter was held at what is called the world's highest BPM’s post; both delegations met in the vicinity of Daulat Beg Oldie (DBO) and Tianwendian (TWD). While the Indian delegation was led by Colonel Rinchen Dorje, the Chinese were commanded by Colonel Song Zang Li. 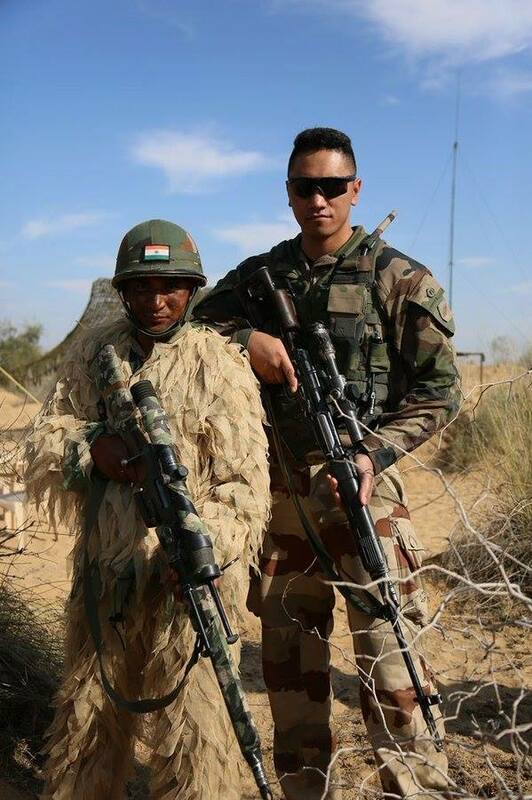 What is interesting is that a local Ladakhi represented the Indian Army. This is what makes India’s strength; China is today unable to incorporate Tibetans or Uyghurs in its defence forces, as they can’t be trusted by Beijing. 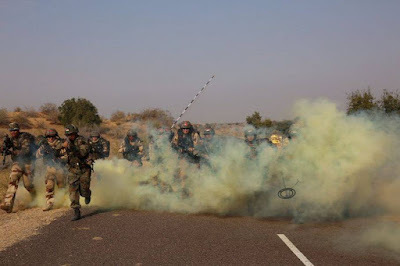 The CBMs come soon after the visit of Northern Army Commander, Lt Gen D.S. Hooda to Lanzhou Military Region, which is responsible for the Ladakh sector (this may change with the ongoing reforms in the PLA). Does all this mean that like in the early 1960s, India is slowly being put to sleep by China? No! In fact, Delhi has decided to go ahead with its border defenses. Take the installation of latest gadgetry along the LAC to monitor movement of the Chinese troops near the LAC. 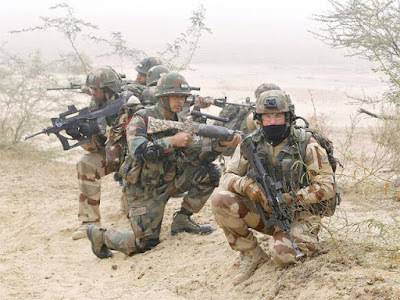 A few months ago, The Excelsior had reported that the MHA and MoD had decided to install high resolution sophisticated cameras to keep surveillance on the PLA activities on the Indian side. Army sources told the J&K daily that the new surveillance cameras would be first installed about 20 kilometers inside the Indian territory to ensure that the system doesn’t fail like the previous ones. And roads and advanced landing grounds are also built on a war-footing. But the question on every defense analyst’s lips is: will the new reforms proceed smoothly? On December 31, President Xi Jinping, who is also the Chairman of the Central Military Commission, inaugurated three new PLA ‘units’ or ‘services’, namely, the PLA Land Army, the PLA Rocket Force and the PLA Strategic Support Force. While the PLA Rocket Force will take over from the Second Artillery Force to “strengthen the trustworthy and reliable nuclear deterrence and nuclear counter-attack capabilities”, the PLA Strategic Support Force will deal with hi-tech warfare in space and cyberwar. The seven Military Area Commands will soon be replaced by five battle zone commands, focusing on combat. 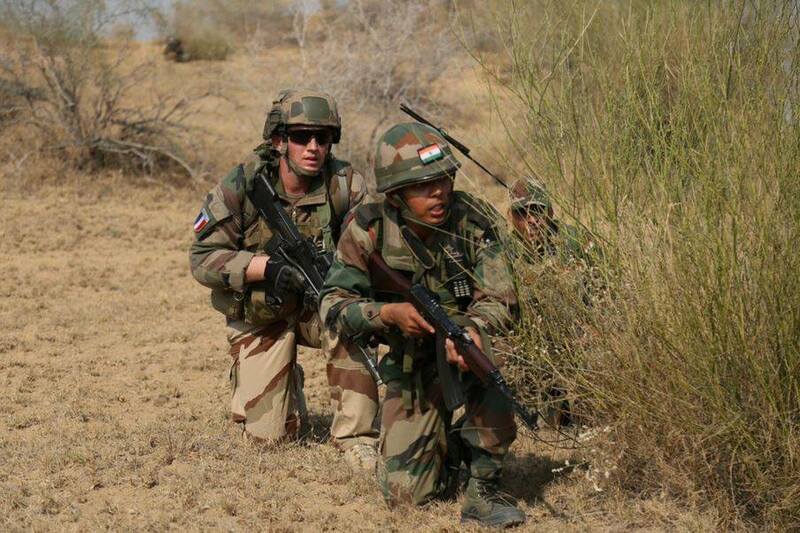 The new Western Combat Zone will replace the two Military Area Commands today facing India in the High Himalaya. The mega reforms maybe complicated by another issue: the morale of the PLA. Indeed, the spirit of PLA officers and troops does not seem very high on the plateau. On December 28, China Tibet Online published photos of a group of new recruits ‘releasing inner discomforts’ in Central Tibet. They were playing a psychological counseling game under the guidance of psychologists. A detachment of Tibet’s border defense troops participated in group training activities in Shigatse; it was themed ‘releasing inner discomforts and welcoming new challenges’. The exercise was meant for the new recruits, who experience inner and outer discomforts, while being posted on the Tibetan plateau. Already in May 2013, the Tibetan Centre for Human Rights and Democracy in Dharamsala had got hold of a fascinating manual exposing the psychological trauma faced by the People's Armed Police (PAPF) in Tibet. During the recent Shigatse ‘counseling’, the detachment’s counselors, Zhang Yan and Li Linfu, “fully played to their strengths by using plain language to explain to the new recruits how to alleviate their own psychological pressure. 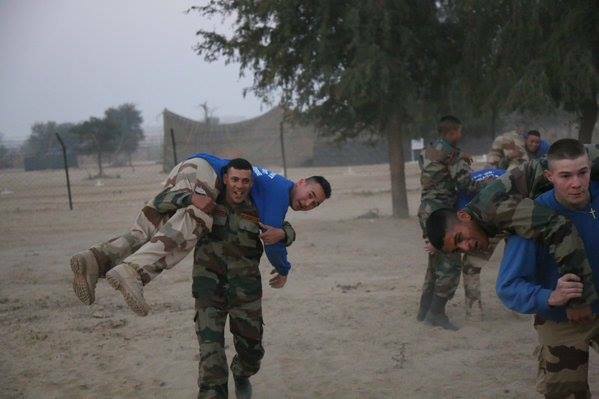 The new recruits participated actively and were enthusiastic, coordinated and willing to try,” said China Tibet Online. This means that several decades after the so-called ‘Liberation of Tibet’, the Chinese soldiers are still not at home on the Roof of the World. India definitively has an advantage in the field of human resource, even if it does not have it in infrastructure and equipment. 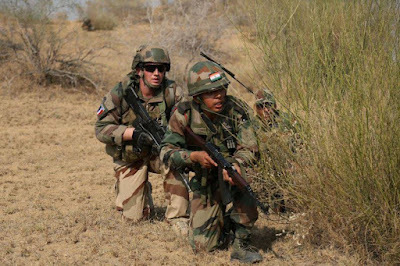 In the coming year, China will try to keep the situation on the border ‘peaceful’ in order to implement its reforms, but Delhi should realize that in the long term, the Chinese defence forces will become fitter, better prepared and far better coordinated. While welcoming the CBMs, India’s leadership should not miss the opportunity to further strengthen its defenses in the Himalayas.